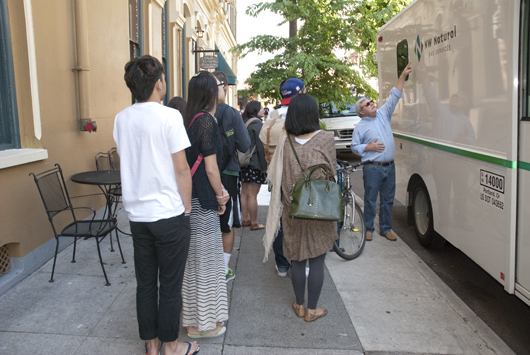 Summary: A Group of Urban Ducks Tour Portland’s Oldtown | Chinatown Galleries and Explore Public Art as Part of the Arts and Administration Program’s Arts and Visual Literacy. 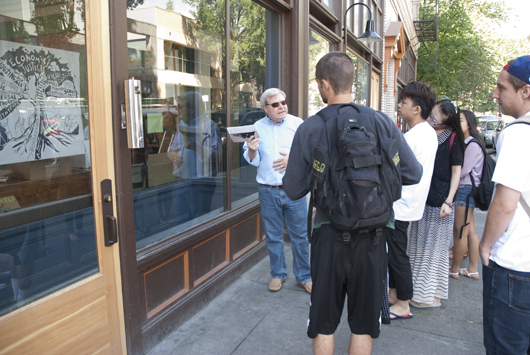 Urban Ducks are newly accepted and admitted University of Oregon students who have the opportunity to take courses at the White Stag Block. 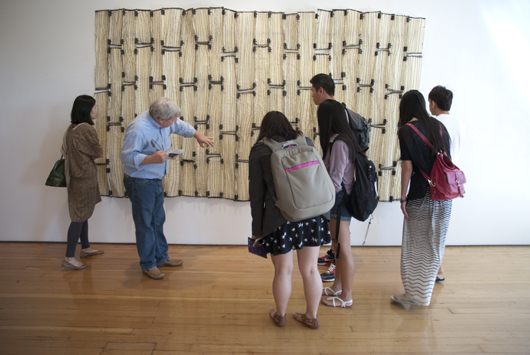 Students [to] explore the interactions of the physical, perceptual, affective, and cognitive modes of learning elements of experience, and how [these elements] come together in creating interpretations and forming judgments about the visual world. 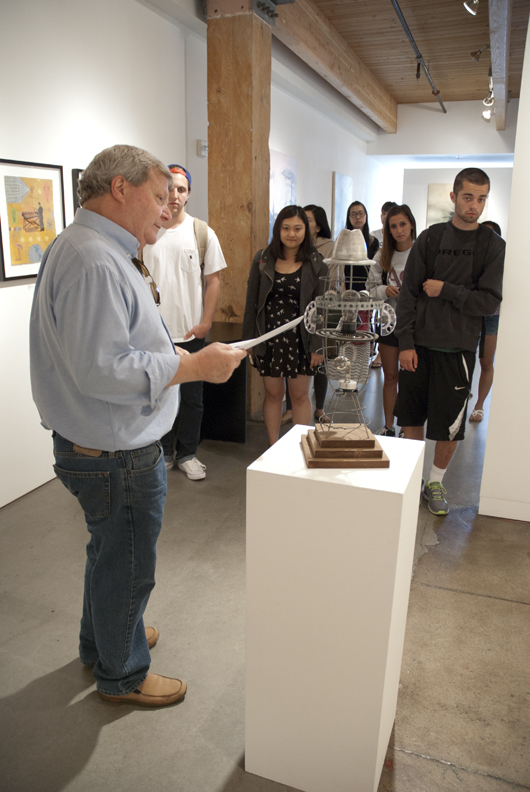 The course is part of the UO Urban Ducks program, the Summer in the City courses, and the School of Architecture and Allied Arts, in addition to being offered by the Arts and Administration program. 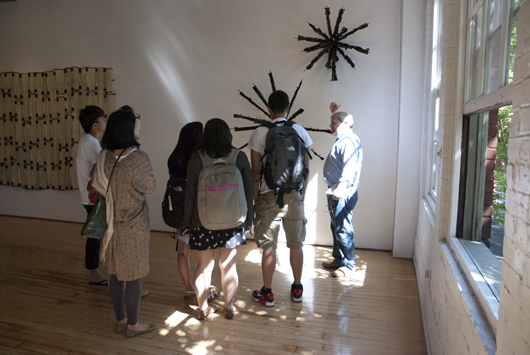 The Friday, July 12 convergence began with a lecture by Bretz to introduce the students to the importance of noticing and observing their environment, to “start seeing and looking more and more at [their] personal environment and to recognize the culture of another.” [Instructor David Bretz]. Bretz continued, emphasizing that “artists are always coming up with new ideas and ways of expressing ideas” —letting us, as the audience, know “we are not alone in our (or their) feelings.” We, as the observers of culture and art, noted Bretz, are being “[pushed] as an audience to see more than what we would normally see” by art, architectural decoration | embellishment and design. 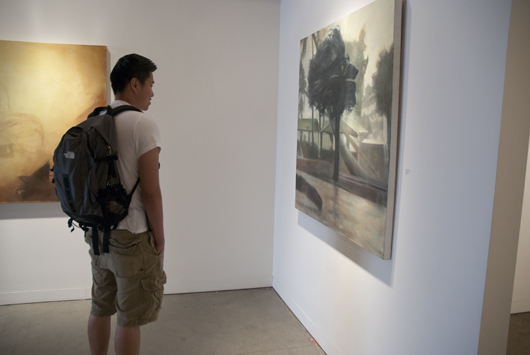 Art and Visual Literacy is a course that is designed to assist individuals in becoming more conscious of and more adept at using visualization as part of their intuitive intelligences. 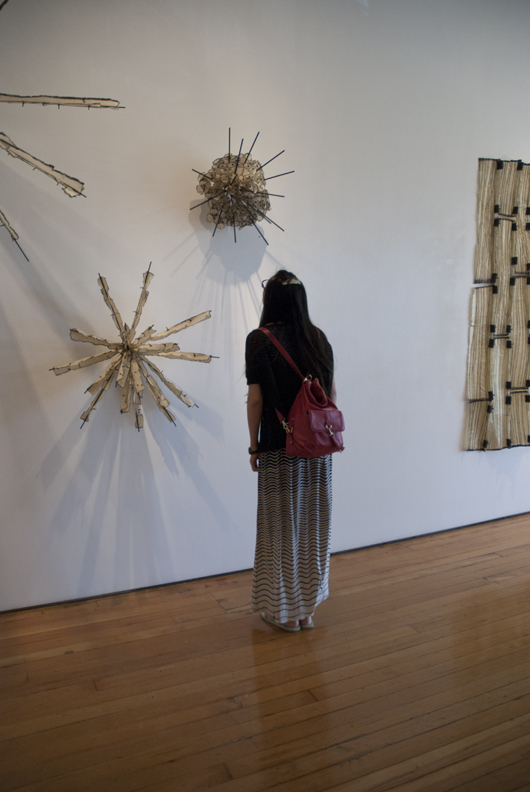 This course draws upon the cultural matrix of ideas and practices associated with the arts to develop a broader understanding of the visual world and our interactions with the innumerable things we see. 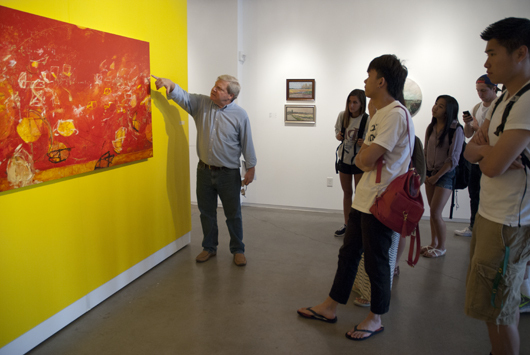 In addition, students are introduced to a set of conceptual skills for actively shaping and creating meanings in their visual culture. 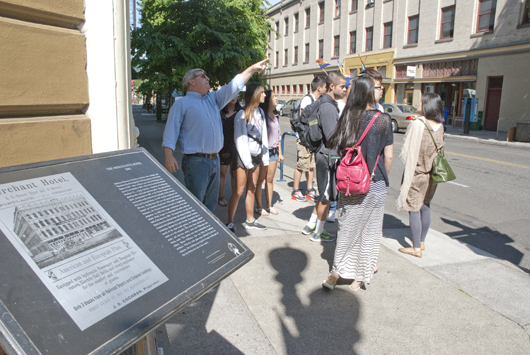 The objective of the tour was to have students experience looking at a variety of visual phenomena within a specific cultural environment of China Town and the Pearl District in downtown Portland. 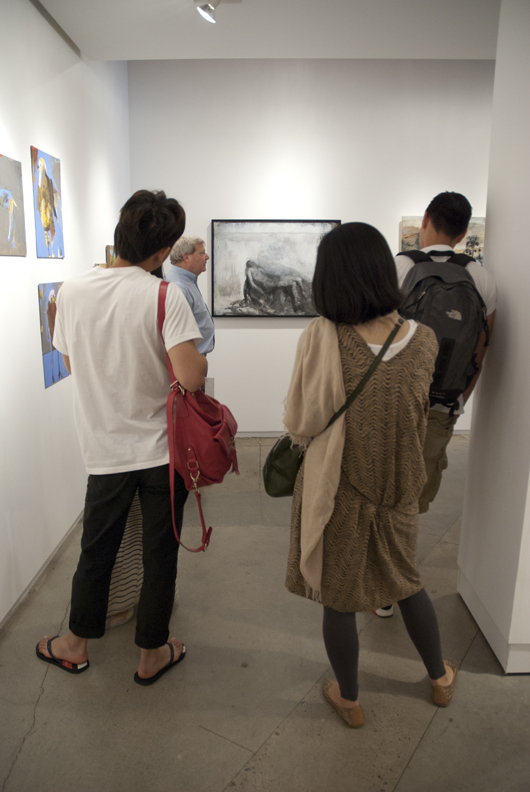 I thought the students were attentive and interactive with the various visual images we observed. 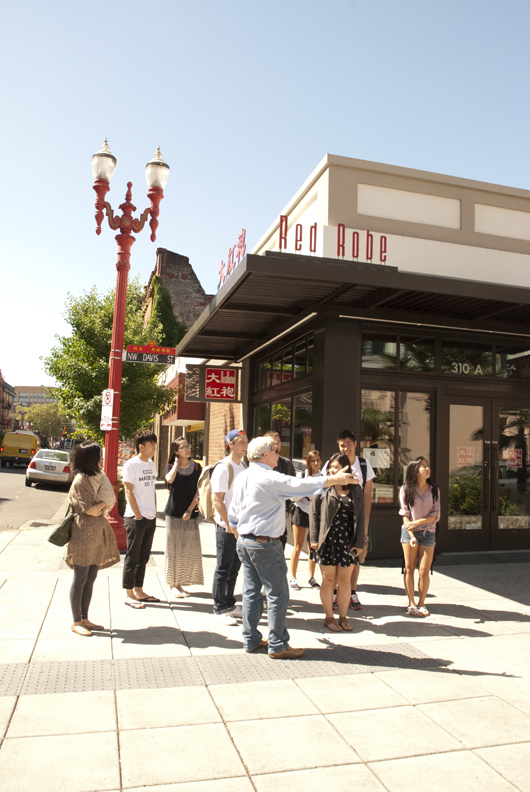 I thought it particularly interesting to observe the students looking at and using the terms of the elements and principles of design in their descriptions and discussions of various architectural details on buildings in this area of Portland. 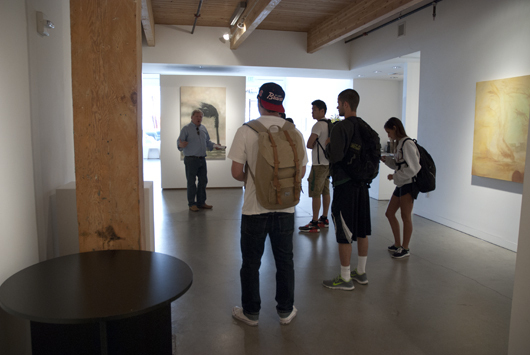 In addition to looking at signage, wall murals, sculpture and landscaping in this urban center, the students visited three art galleries, Butters Gallery LTD, Augen Gallery, and Froelick Gallery. 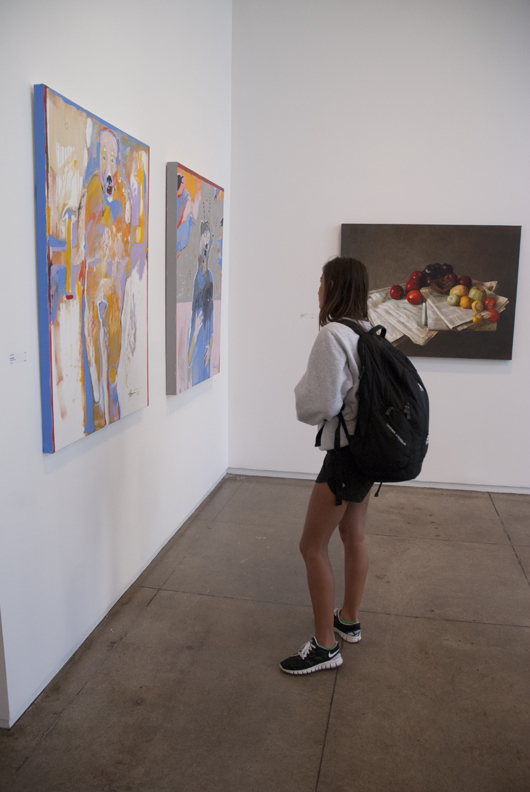 I noticed that the students were beginning to use their descriptive and interpretational skills when they viewed the art in the three galleries we visited. 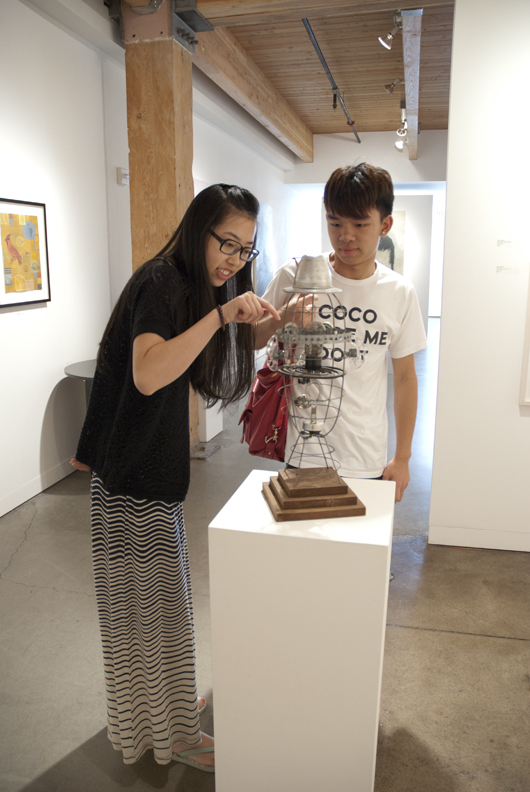 It is very gratifying to observe students using newly discovered skills when viewing art. 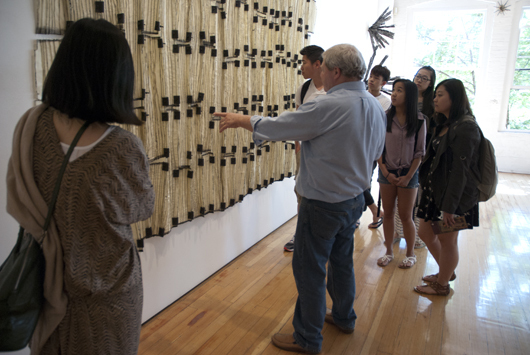 I believe the students were engaged in viewing the variety of visual art and objects, asking questions and contributing to discussions during the tour. 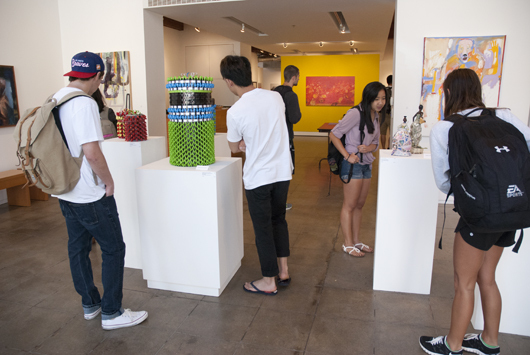 I believe their willingness to explore art and culture and to express opinions and personal perspectives in this regard is commendable. 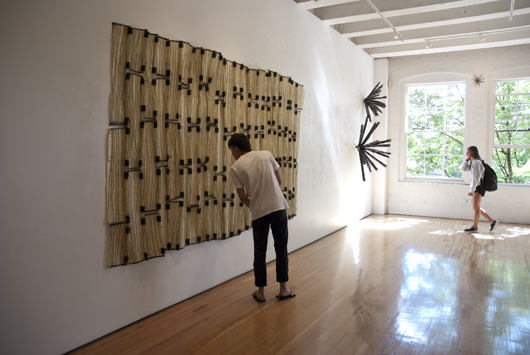 Images from July 12, 2013. 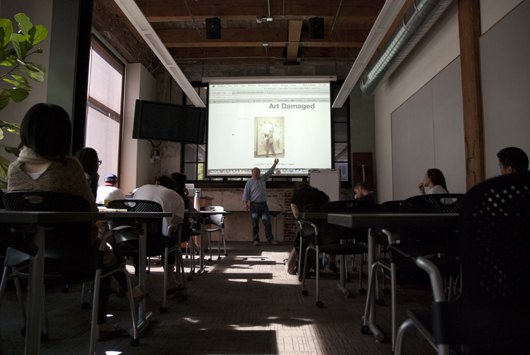 Instructor David Bretz addresses students in his course, Art and Visual Literacy at the UO in Portland. 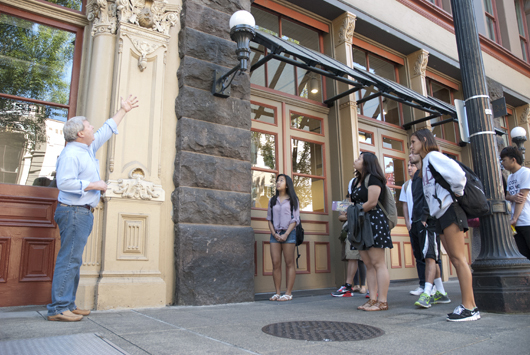 Students learn to notice decoration and embellishment in the built environment, here on the White Stag Block. 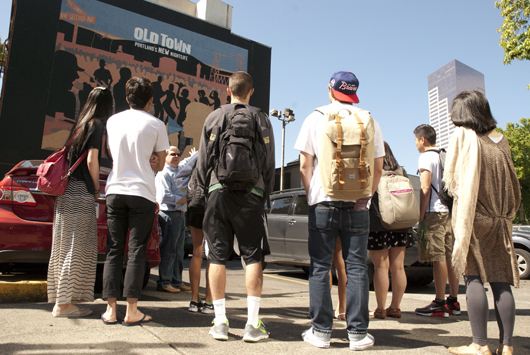 Instructor Bretz pauses to have students consider the graphic design elements of the Old Town mural and how it works to convey a feeling, mood and overall, aesthetic. 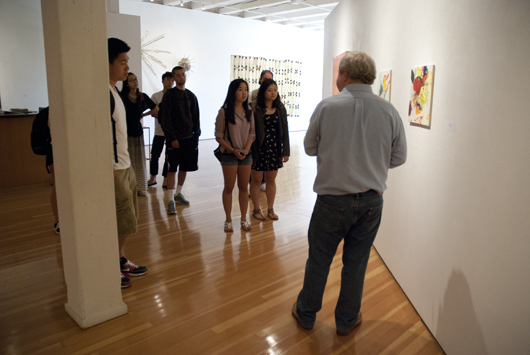 The tour included encouraging students to look at all aspects of their environment. The use of fonts in branding was considered as students were asked to regard how a font used in a logo conveys identity, history, and mood. 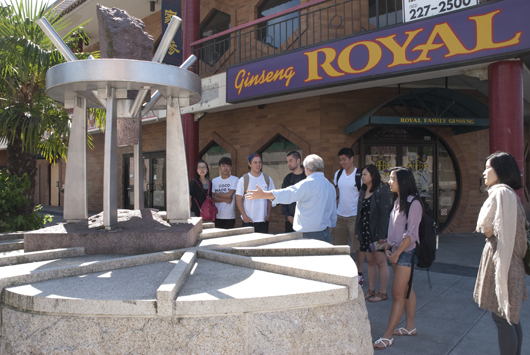 In Chinatown, instructor Bretz urged students to look at the elements that conveyed a feeling of what makes this place "Chinatown." 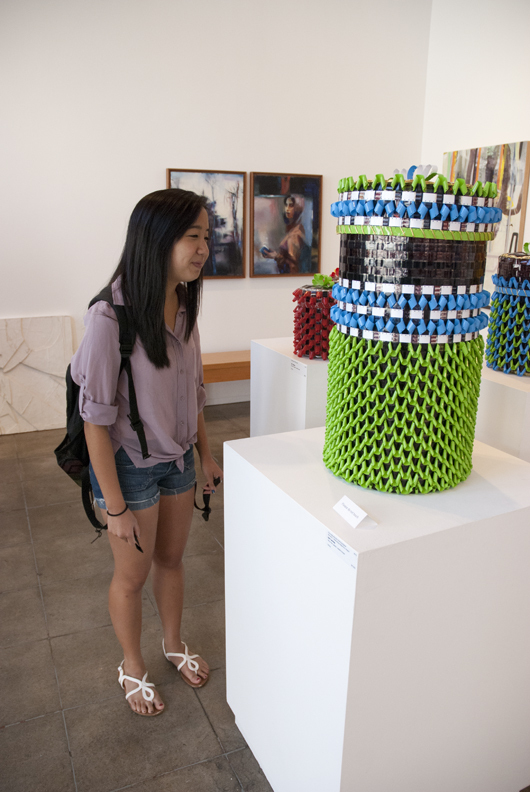 Looking at the public art, the "abacus" familiar to some of the students is in this piece. 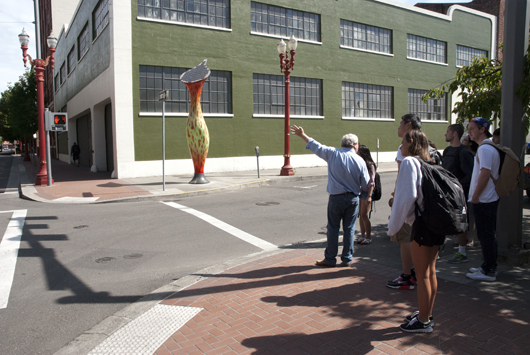 Gesturing to the lamp posts, the public art and the exterior facades of the surrounding buildings, Bretz's guidance introduced students to greater understanding of their environment. 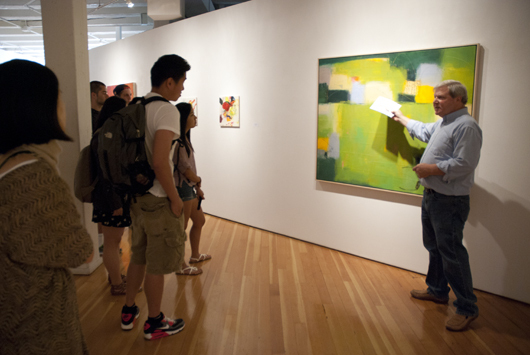 Instructor Bretz teaching about the ability of the public to touch, handle and directly have contact with public art---not so the case with art in galleries where the etiquette is much different. 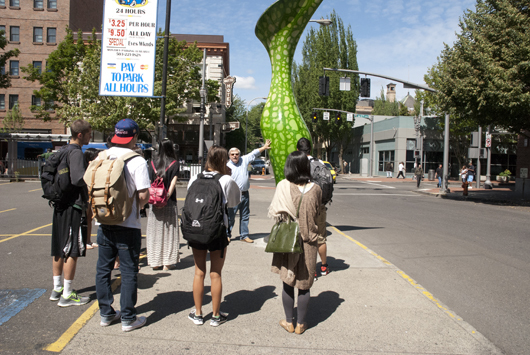 Here, Dan Corson's Nepenthes. 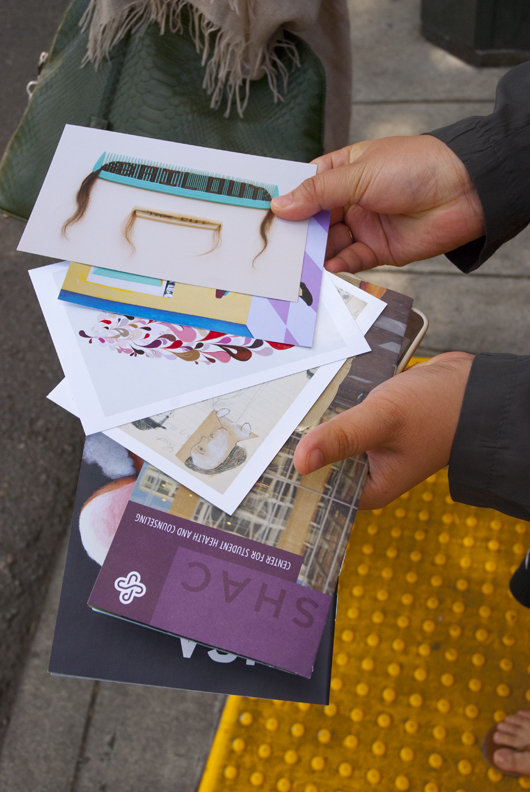 Looking in shop windows and noticing the use of fonts, display of art and various other visual "cues." 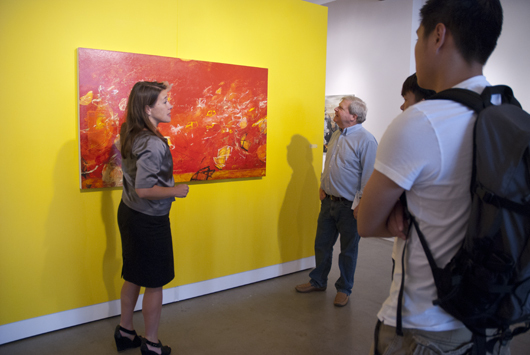 Froelick Gallery with gallery director, Rebecca Rockom. 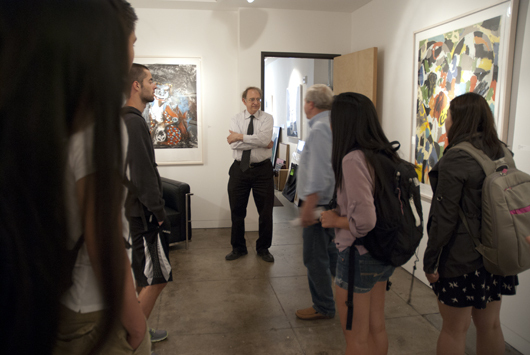 Augen Gallery's Bob Kochs talks to students about the current international art market. 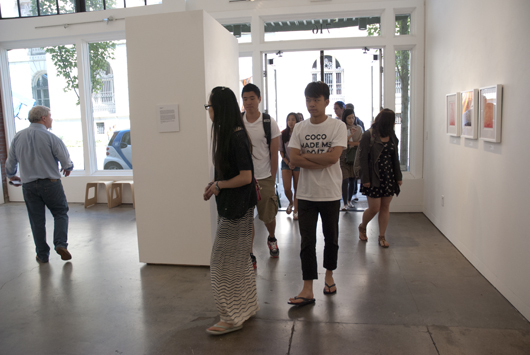 Students gathered brochures for art exhibitions in Portland from the galleries. 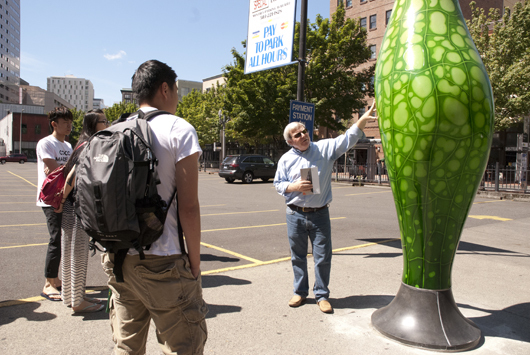 Watching Regional Arts and Culture Council install permanent plaques for the public art installation by Dan Corson: Nepenthes, Davis Street in Old Town | Chinatown. 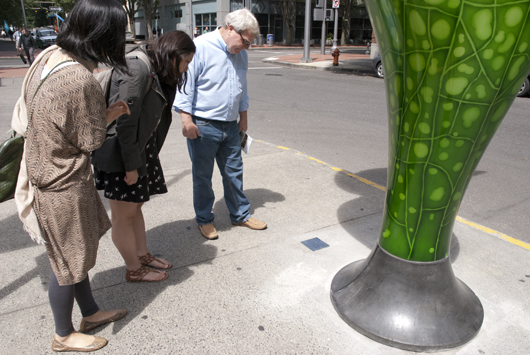 Reading the public art plaques installed by the Regional Arts and Culture Council for Dan Corson's Nepenthes on Davis Street.